The pretty Powder Blue Dwarf Gourami is an attractive and hardy fish, enjoyed by both the beginner and the advanced aquarist! 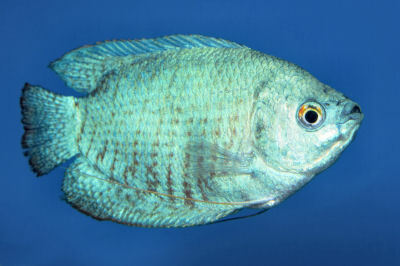 The Powder Blue Dwarf Gourami is an attractive color-morph of the Dwarf Gourami Trichogaster lalius. It is one of the more "solid" colored varieties. It has a beautiful iridescent "powdery" blue coloring overall with very diminished vertical red striping. It was developed by breeders selectively pairing specimens for the desirable blue coloration and strengthening it over several generations. This resulting gorgeous fish makes an outstanding show specimen for the aquarium. This variety is sometimes called by other common names like Coral Blue Dwarf Gourami and Blue Dwarf Gourami. Other than its coloration however, this variety is the same in in all other manners as its predecessors. These fish stay fairly small with the males reaching only about 3 inches (7.5 cm) in length. The females are a bit smaller at around 2 1/3 inches (6 cm). This fish is a Labyrinth fish, so are distinguished from other types of fish by their ability to breathe atmospheric oxygen. They have gills like all fish, but they also have an additional respiratory organ called the "labyrinth organ". This is an adaptation that gives these types of fish the ability to breath oxygen by gulping air at the surface of the water. It has been found that the size of this organ is individual to each fish, depending on the environment it is adapted to. Labyrinth fish that are adapted to oxygen depleted or highly polluted waters will have a more extensive organ than those living in good quality water that is plentiful and well oxygenated. Another labyrinth fish characteristic is that of being a bubble nest builder. In an aquarium with an active male, you can see a cluster of bubbles on the top of the water. Once the female lays the eggs, the male will pick them up in his mouth and put them in his bubble nest and will continue to guard the eggs until they hatch. This fish is quite hardy and makes an excellent choice for the beginning aquarist as long as it's housed in a properly set up tank with regular maintenance. It is undemanding and fairly easy to breed as well. With its small size a single fish could be kept in a smaller aquarium of at least 5 gallons, but a 10 gallon tank will suit it much better. The tank needs lots of plant cover for nest building, but also to provide plenty of places to hide. A larger aquarium allows for a better planted arrangement and the water will be more stable, and there will be room for some companions as well. These fish are usually peaceful and will be fine in a community tank. But they are little timid, especially if housed with fish that pester them. Fish that are very active, large or aggressive will cause them to withdraw. On the other hand fish that are gaudily colored, like guppies and bettas, as well as other dwarf gouramis, will bring out a territorial aggression in them. The best tankmates are other species of small, peaceful fish. The Powder Blue Dwarf Gourami is just one of a number of beautiful varieties that have been developed from the Dwarf Gourami. Some of the other popular varieties include the Neon Blue Dwarf Gourami, also known as the Rainbow Gourami, and the Flame Dwarf Gourami, also known as the Fire Red or "Blood" Red Dwarf Gourami. The Powder Blue Dwarf Gourami is a captive bred color morph developed from the Dwarf Gourami. This variety was developed by breeders over several generations, by selectively pairing specimens for the desirable blue coloration. Other common names they are known by include Coral Blue Dwarf Gourami and Blue Dwarf Gourami. The Powder Blue Dwarf Gourami is a captive bred color variety developed from the Dwarf Gourami. The males will normally reach about 3 inches (7.5 cm) in length, with the females being slightly smaller at around 2 1/3 inches (6 cm). Their coloring is very pretty 'powdery' almost iridescent blue overall with very subdued vertical red striping on the body and fins. This is a hardy fish and makes a good choice for the beginner. They are fairly undemanding as long the tank is properly set-up and maintained. 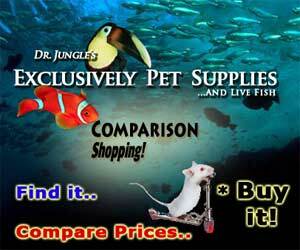 They readily accept all sorts of aquarium foods and are fairly easy to breed. They are prone to disease if the water quality is not kept up, so their tank does need regular maintenance. The location of the tank is important too. These fish get nervous and will get stressed it their tank is in areas that are loud, or where there's a lot of traffic around the tank. The Powder Blue Dwarf Gourami is an omnivore and will generally eat all kinds of live, fresh, and flake foods. To keep a good balance give them a quality flake or pellet food as the base to the diet. Supplement this with live foods such as white worms, blood worms, brine shrimp, or any other suitable substitute. Vegetable tablets can be offered as well. Generally feed once or twice a day. The Powder Blue Dwarf Gourami will swim in all parts of the tank, but particularly likes the middle and top portions of the aquarium. These are small fish and a single specimen could be kept in a smaller aquarium of at least 5 gallons. However a 10 gallon tank is recommended as it will suit it much better. There's plenty of space for plants and the water will be more stable, and there will be room for some tankmates as well. It is desirable to keep the tank in a room with a temperature as close as possible to the tank water, or risk damaging the labyrinth organ. The tank should have an efficient filtration system but should not to create too much of a current. Air stones are also recommended for these fish as they prefer well oxygenated waters. Powder Blue Dwarf Gouramis are a good community fish that can be kept with other peaceful fish. Large, active, or aggressive fish can easily intimidate them.They can be timid and may hide when first introduced to an aquarium. It may take some time for them to become comfortable and behave normally. The male is much more colorful and has a pointed dorsal pennant, they also generally have a smaller belly than the female. The female has much less color and her dorsal is rounded or curved. Breeding the Powder Blue Dwarf Gourami is not too difficult, but the behavior of the males can be somewhat unpredictable. It is best to provide a breeding tank, either a 10 or 20 gallons works fine, and keep the water level low at about 6 - 8" (15 - 20 cm). Normal water parameters are fine but raise the temperature to between 80 - 84° F (26 - 29° C). Add a small gently air-powered sponge filter or some peat filtration. They need several fine leaved plants, like Hornwort or Milfoil, along with some floating plants like Ricca for comfort. Sometimes during the courtship and after building the nest, a male may consider females to be rivals and bully them. So the plants are essential for the female to have places for retreat. A male and one or more females need be well conditioned with small offerings of live and frozen foods several times a day. When well fed, females should begin filling out with eggs, appearing very plump. Add one or more females to the breeding tank several days before the male, preferably in the dark, and continue feeding conditioning foods. Then add the male. Like most fish in this family, male Dwarf Gouramis are bubble nest builders. In an aquarium you will see a cluster of bubbles on the top of the water. Once the nest had been built the male will begin a courtship display, usually in the afternoon or evening. He will flare up his dorsal fin and begin swimming around a female trying to draw her underneath his nest. If the female is willing she will begin circling with the male. To spawn she will touch the male with her mouth, either on the back or on the tail. The male then embraces the female, ultimately turning her on her back and the female will release about 5 dozen clear eggs. Once the female lays the eggs the male will immediately fertilize them. The eggs are lighter than water and float to the top. The male will pick any not in the nest in his mouth, and put them in his bubble nest. The pair will then spawn again until anywhere from 300 to 800 eggs are produced. If there are other females, the male may spawn with them all. After spawning remove the females, as the male will become totally intolerant. He will continue to tend the next and guard the eggs until they hatch. The eggs will hatch in about 12 - 36 hours, depending on the temperature, but will stay in the bubble nest and continue developing. They will be free swimming and leaving the nest in about 3 days. At this time the male should also be removed as he may eat the young. Free swimming fry can be fed infusoria or a liquid fry food until they are large enough to eat baby brine shrimp. Separate rearing tanks will be needed as the fry vary in size, and bullying is common in these small environments. See the description of breeding techniques in: Breeding Freshwater Fish: Anabantoids. Also see Fish Food for Fry for information about types of foods for raising the young. Powder Blue Dwarf Gouramis are very hardy so disease is not usually a problem in a well maintained aquarium. Some diseases they are prone to are bacterial infections, constipation and Hole in the Head if good water quality, nutrition, and maintenance is not provided. With any additions to a tank such as new fish, plants, substrates, and decorations there is a risk of introducing disease. It's advisable to properly clean or quarantine anything that you want add to an established tank prior to introduction, so as not to upset the balance. The Powder Blue Dwarf Gourami is readily available both in stores and online. The males are moderately expensive, with females (or purchasing by the pair) usually being a little less. I have a male powder blue dwarf gourami and I think he is sick I just cleaned his tank and now he is sinking to the bottom but he is still breathing and he isn’t moving around a lot he is the only fish in the tank and he is only one year old. Someone please help me I love him so much. I have a powder blue dwarf gourami that is in a 20 gallon tank with just one male molly. There were 6 danios also but this was just a holding tank while my new 55 gallon cycled with stability. My gourami started hiding and not eating much if at all. I have since moved all the danios into the 55 gallon but my gourami is still just hiding and not eating and staying towards bottom of tank. The danios were not in the tank long maybe two weeks and I did multiple water changes to keep the amonioa level down. Everything is testing good but still not much any ideas?? It sounds like you may have water quality problems with your tank. Although it is a very large amount of water, and few fish, there is some reason your gouramis started having these problems. I would do a fairly large water change, make sure and use a water conditioner to remove chlorine and chloramines, and then check the ammonia and pH levels. i just got two blue gourami in my bowl. earlier they were calm but suddenly one of them started chasing the other and after a whie it changed it colour and turned black.I am not even sure if they are male or female.Please tell me if this is a matter to worry?